On day 2 of the Google I/O conference, I spent about 20 minutes talking with a knowledgeable HTC representative at the HTC booth and tried to get some comments on a few questions a lot of you wanted answered. This information is coming directly from the HTC rep who seemed very knowledgeable. The newly announced Froyo update is not going to be coming to EVO 4G in time for launch on June 4th, contrary to what we thought earlier (i.e. EVO getting an OTA update after the Froyo announcement). HTC only recently got their hands on some Froyo builds and will have to go through the lengthy process of merging their custom Sense UI code with it, which can take months. Later on, I spoke with an Android core developer who works for Google, and he noted that it should now be theoretically a lot easier for manufacturers to merge their code, compared to doing so in 1.5, 1.6, and 2.1. Manufacturers have a lot more experience with such merges now. Froyo did indeed decouple most core applications from the OS, as we expected, though the developer didn't have a list readily available. The changes in Froyo have been more transparent and low level, in the areas manufacturers don't need to touch nearly as much. Now going back to EVO and HTC. Froyo is not needed for 4G to work, the HTC rep explained. 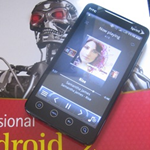 At the kernel level, it was pretty simple for HTC to add support for 4G connectivity because they have access to the Android open source code. But what about the applications? How would an application be able to determine whether the phone is currently connected to 4G or 3G if it is still using the same Android 2.1 APIs which don't know anything about 4G (there is no support for 4G in the Eclair SDK)? Turns out, the solution HTC came up with was to provide developers with a small library that would enable their applications to access the 4G API (I am thinking all it would need to do is add an extra enum value for 4G to the enumerator describing the types of available connections but I may be wrong). All app developers would need to do is ship their software with the library included. Once EVO 4G does receive Froyo, the library will no longer be needed, but by design all application code will still work without any further changes needed. tl;dr: EVO 4G will not have Froyo on June 4th, its release date. Froyo will be available some time after that, as soon as HTC merges Sense UI into it, tests, and releases to Sprint. Many of you have been wondering whether the 8GB MicroSD card that comes with EVO 4G is class 2 (slow) or class 6 (fast). 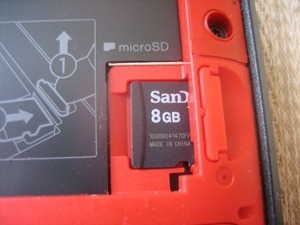 Having received a free EVO 4G at the conference, I inspected it and found a Class 2 standard 8GB SanDisk card. Sorry to bring the slightly disappointing news. Here is a photo of the card. It doesn't show but there is a little logo showing 2 wrapped in a letter C. HTC seems to be in cahoots with SanDisk on the SD card front. This is all I wanted to cover for now. In conclusion, I wanted to say that I've been using the EVO for about a few days now, and while it took a bit getting used to, I can no longer go back to the smaller sized, slower HTC Hero anymore - it feels like EVO's tiny distant cousin. Speed, snappiness, and a gigantic screen (which makes it a lot easier to type) make for an excellent experience. My updated verdict is: get it as soon as you can, give it some time to get used to a bigger screen size, and you will not be disappointed, especially when that 4G network does finally arrive to your area (if it hasn't already).